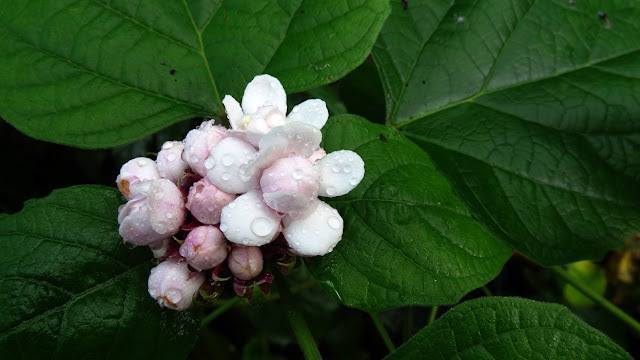 The Chinese Glory Bower flower is a sumptuous garden plant that is known by a variety of formal, scientific names: Clerodendrum philippinum, Clerodendrum fragrans var. multiplex, Clerodendrum fragrans, Volkameria fragrans, Clerodendrum fragrans var. pleniflorum. It is a native of China and Japan, which has been naturalised in tropical and subtropical climates. It is a shrub, up to 2.4 metres tall with heart shaped leaves, up to 25 cm long. It propagates with underground runners, and can be invasive. The Chinese Glory Bower usually encountered in nurseries has double very fragrant pink or white flowers, 2 cm across. The wild form is single-flowered. The flowers are most fragrant in the evening and attract butterflies. When the leaves of flowers are bruised they can exude an unpleasant pungent odour. One of the best time to photograph them is with their fresh dew drops! Nice! Oh lovely photo -- and wonderful that it attracts the butterflies! This is a new shrub to me. Probably unsuitable for the British climate. I hope you will show us another image when the buds are fully opened. Here is a picture of the fully open flowers, Hannah. The fragrance is just amazing. I doubt if the bush will withstand the British winter... However, Kew gardens may have one in their conservatory, perhaps? Don't know if I know this flower, but their colors and forms are so delicate! Wonderful photo. Lovely with the drops. And it is not that kind of typical flower, looks realy interesting. Thanks NixBlog, I'm happy to join. This is beautiful! And, I agree with the other commenters who say it looks even better because of the dew drops. (I wish I'd have thought of that myself!) Thanks for hosting, by the way, I am relatively new to FFF, but I really like it! Oh, i am a bit late in linking here, as i was away yesterday. I hope they will still see my post, haha. Hi Nick. I am not familiar with this one, even if it's Chinese. this reminds me of my grandmother's brooch. very pretty. Beautiful photo. Virtually every photo I took this week had raindrops as well. We've had quite a lot lately haven't we. So beautiful with the tiny droplets of water. Beautiful shot with the water droplets. You are the only other person who has blogged about this Chinese Glory Bower. I grew this in Singapore, and I had such a lot of flowers and bushes. I photographed only one bunch of flower which was quite small. I had those that were 8 inches across. Thanks for memories. Thankyou for inviting me to join the fun, I will add the badge to my memes badge page to prompt me to do so another time. The buds look so delicate with the drops of water on them. Any fragrant flower is high on my list of favorites! exude an unpleasant pungent odour. heheheh, that's what my husband says, so I couldn't bring my flowers home, instead I gave to friends. FFF19 - A COMMON "WEED"